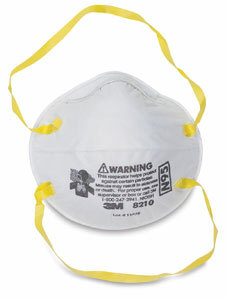 This mask provides protection against certain particles generated during sanding, sweeping, or other dusty operations. Exhalation valve keeps the face cool and dry and includes an adjustable nose clip. 3M respirator masks are easy to breathe through, lightweight, and comfortable, providing quality, reliable protection against pollutants. Fixed elastic straps offer a good fit. Meets NOISH Standards. ® 3M is a registered trademark.